Great Lakes Books Series, 9780814331705, 440pp. In 1862 at the age of thirty-two, Centreville, Michigan, physician John Bennitt joined the 19th Michigan Infantry Regiment as an assistant surgeon and remained in military service for the rest of the war. During this time Bennitt wrote more than two hundred letters home to his wife and daughters sharing his careful and detailed observations of army life, his medical trials in the field and army hospitals, dramatic battles, and character sketches of the many people he encountered, including his regimental comrades, captured Confederates, and local citizens in southern towns. Bennitt writes about the war's progress on both the battlefield and the home front, and also reveals his changing view of slavery and race. Bennitt traces the history of the 19th Michigan Infantry, from its mustering in Dowagiac in August 1862, its duty in Kentucky and Tennessee, its capture and imprisonment by Confederate forces, its subsequent exchange and reorganization, its participation in the Atlanta and the Carolinas campaigns, its place in the Grand Review in Washington, and the final mustering out in Detroit in June 1865. John Bennitt's significant collection of letters sheds light not only on the Civil War but on the many aspects of life in a small Michigan town. 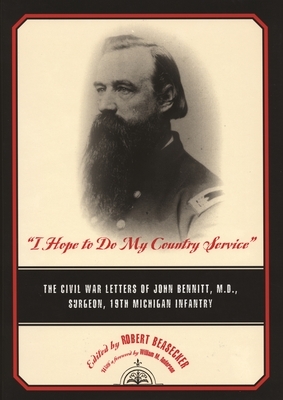 Although a number of memoirs from Civil War surgeons have been published in the last decade, "I Hope to Do My Country Service" is the first of its kind from a Michigan regimental surgeon to appear in more than a century. Robert Beasecker is Senior Librarian at Grand Valley State University in charge of Special Collections and University Archives.